RUSH: Get this one, folks, get this. On Joe Scarborough’s show today, Al Sharpton and Mike Barnicle. I mean, there’s a pair. Al Sharpton, Crown Heights, Freddy’s Fashion Mart. Mike Barnicle, plagiarism fame. They’re out there. You know what they’re saying? Opposition to Bloomberg. You know, Bloomberg and his gun control. What is Bloomberg? This guy’s like a Mad Hatter. He’s like a bond villain and he’s got this idea of gun control, and he’s trying to just enforce all kinds of gun control. Here you have Sharpton who knows anti-Semitism when he sees it, and Barnicle, they’re out there, anybody who opposes Bloomberg and his gun control efforts in New York is anti-Jewish. 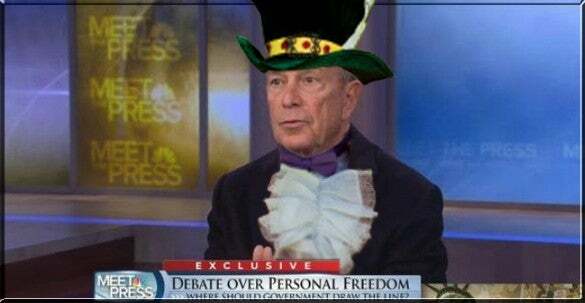 That’s why they’re opposing Bloomberg. It has nothing to do with guns, nothing to do with Second Amendment, nothing to do about freedom, the Constitution. No, it’s the typical anybody opposed to Bloomberg is anti-Semitic. BLOOMBERG: I have a responsibility, and I think you and all of your viewers have responsibilities to try to make this country safer for our families and for each other. And if I can do that by spending some money and taking the NRA from being the only voice to being one of the voices so the public can really understand the issues, then I think my money would be well spent. GREGORY: Where’s the line? Where is it too far for government to go? BLOOMBERG: I do not think we should ban most things. I do think there are certain times we should infringe on your freedom.